The back story here is that my Homalomena 'Perma Press' had gotten very tall and floppy, plus it's never been a particularly full-looking plant because it's been stuck inside in less-than-ideal conditions for most of its life. So I finally got fed up with it and cut the tops off the two long stems. 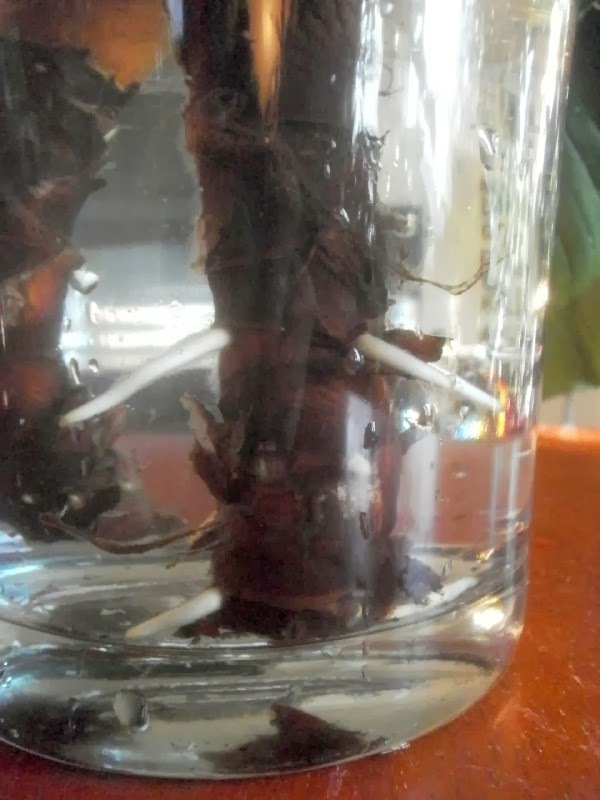 I didn't want to just throw them out, especially since I didn't know if the stumps would resprout, so I put them in water, and voila. The ultimate plan is to stick these rooted tops back in the pot with the original plant, in hopes of getting a more presentable specimen. The transition from water to soil is hard for a lot of plants, but aroids (with the exception of Epipremnum aureum) usually handle it well, so I'm optimistic. 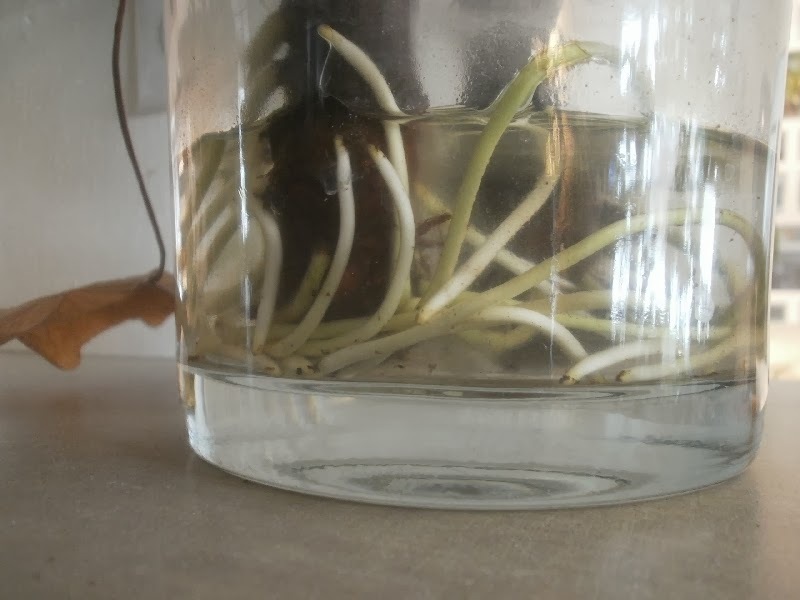 I should probably do this sooner rather than later, because the roots are getting longer, and I'm not maintaining a high water level in the vase very well. 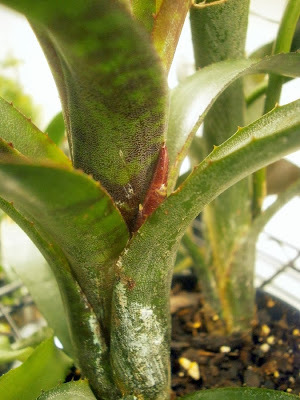 It wasn't long ago that this plant surprised me by beginning to produce an offset, something I intended to blog about but apparently never got around to. N. ampullacea 'Dark Star' is one of those plants I've had forever (since October 2008) that have just never gotten the signal to do much. It's grown a new rosette of leaves a couple times, the first time being in August 2009, and it's lost a rosette once, which I didn't bother to record. 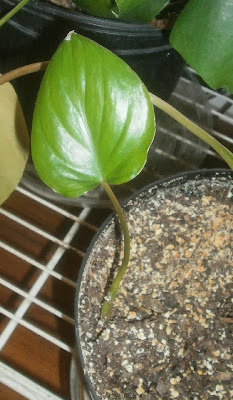 But it's always been more or less the same size, growing new leaves occasionally, but not in any hurry or anything. So the offset was interesting, but I figured it just predicted the death of one of the old rosettes of leaves. It turns out that yes, that's probably what it predicted, but at least I'll get flowers first. Neoregelia flowers (previously) (previouslier) are one of those flowers that I think are actually prettier and more interesting before they open, so I'm happy to have gotten to see them while still buds: usually the whole process happens too fast to catch. Sharp-eyed readers will also notice that my thrips problem is still ongoing, as of 18 December when this photo was taken: it's one of my better thrips pictures, actually, and I didn't even see it until I had uploaded the pictures to the computer and was flipping through them to decide which one to use for the post. S/He's more or less directly to the right of the tip of the largest flower bud, and directly up from the tip of the flower bud in the lower right. More detail is visible in the full-size view of the photo. 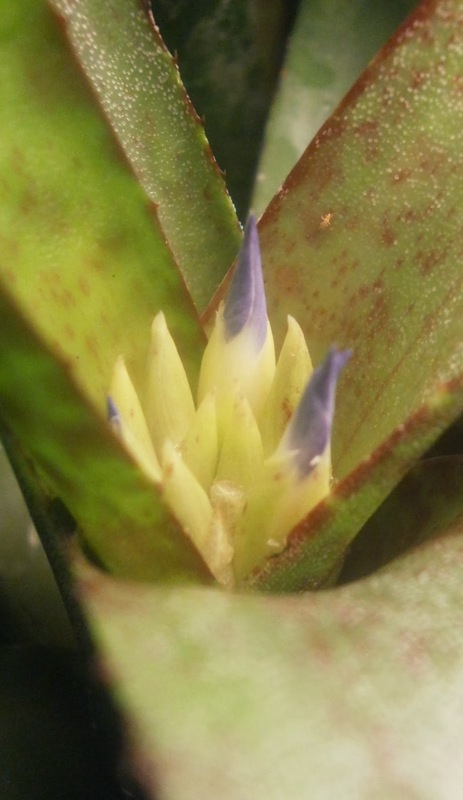 By the rules of bromeliads, this means that the rosette of leaves which is blooming will have a period of time in which to produce new rosettes, after which point it will die, so the whole thing is very good-news-bad-news, but that's plants for you. Well. It's looking increasingly like my itchiness problem is nothing more than dry skin, and possibly it's happening for the first time this winter because this winter is seriously cold, relative to recent previous ones. I mean, January is always cold, but it seems like this winter got colder a lot earlier, has been very cold more often, and has provided unusually few opportunities for thaws. As I write this, on 4 January, the forecast for the day you're reading this, 6 January, is for a high temperature of -10F / -23C. A high temperature. As in, the very warmest it's supposed to get is -10. Wind chill of -44F / -42C, at 8 in the morning. So: probably dry skin. I'm guessing this partly based on a recent conversation with my dad, who said that he had a really itchy winter the year after we moved from Texas back to Iowa, and that baby oil made it tolerable. And apparently it's never recurred (at least not to the same degree), which was a comforting thought until we actually got some baby oil and I tried it and the itching come back worse than it had been previously. Shaving the itchiest areas actually seems to help more than anything, though that presents its own problems. The itching is caused by nothing in particular, and nothing makes it better. Were it not for the fact that no matter how bad it gets, it comes and goes entirely on its own, so occasionally I'll get a 36-hour break (though most are closer to nine hours), I wouldn't be able to water the plants, write blog posts like this (which is just scintillating, I know), or sleep. If I'm sounding a little desperate and deranged here, well, that's because I am. Meanwhile: orchid picture. Though it feels a bit wrong to be contemplating orchids with weather like this. Or not wrong, but nonsensical. 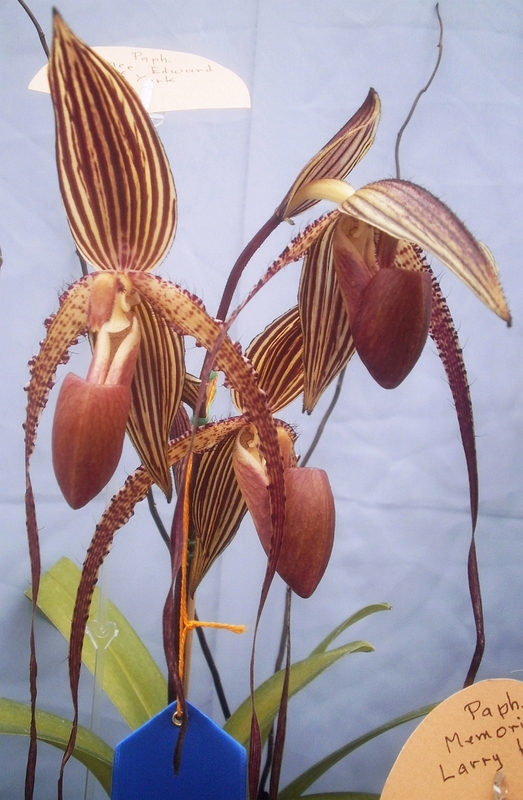 Surely the same planet can't contain -44F wind chills and tropical orchids at the same time, can it?